Our in house finance facility can offer terms and payments that in many cases better those offered by your own bank. 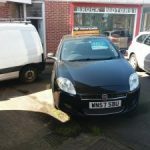 Plus we GUARANTEE an offer of finance to anyone who buys one of OUR cars whatever their credit rating/score subject to proof of residence and income. Our on site MOT and service facilities mean you can be assured of excellent aftersales service. Please check out our websites crowtrees.co.uk and brockfinance.co.uk or COME AND VISIT US!